Embrilliance embroidery software for Mac and PC. » Embrilliance Nominated for 2 Reggie Awards! Embrilliance Nominated for 2 Reggie Awards! We received some exciting news this weekend! Embrilliance was nominated for TWO Reggie awards this year! 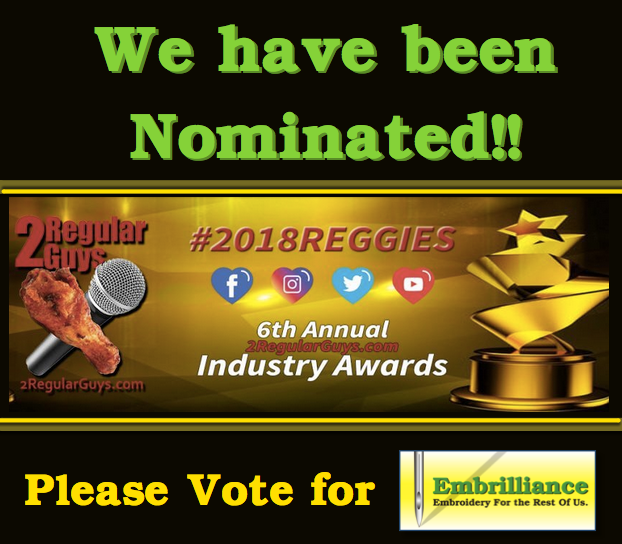 The Reggies are an annual online award that are put out by the commercial embroidery podcasters 2 Regular Guys Podcast We are THRILLED that Embrilliance was nominated for best new product 2018 (for StitchArtist 3D foam underlay) as well as Company that provides the best customer service! If you would like to vote for us, please do! There are very few industry awards, and we appreciate your votes for this rare and prestigious honor. And for those of you are are in our StitchArtist Digitizing Fans group on Facebook, one of our frequent contributors, Erich Campbell, is up for some awards too. If you enjoy Erich’s posts, please consider a vote for him as well. Voting goes through December 13, 2018 – Thank you! We know, most of the elections are over, hooray! but this one will end on December 15, 2018. Posted 5 months ago at 2:04 pm. "This fixed my problem. Thank you for replying with a remedy so soon. I"m not used to this fast of a reply AND a fix from any other software support team. Again, thank you very much."